The profession guides are up and are updated to patch 4.3. The Inscription guide is the most detailed, but all of them will at least show you a step by step method to get to 525 as easily as possible. You can access all of the guides from the “Professions” tab, above. Feel free to comment. 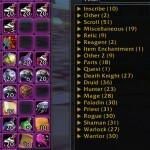 You can also go here to check out a product that is an in-game professions guide to leveling all the professions. It’ll even show you were to farm your materials. On my wishlist for future profession changes is a complete overhaul of the recipes and material requirements. It’d be nice to see crafting take on greater importance. Inscription’s fine, but Blacksmithing?